Do you enjoy walking? I definitely need to do it more and these days it does seem much more appealing than running! Research has proven that taking regular walks improves the heart, trims the waistline, can clear the mind, and simply leads to a healthier life? I can know this in my head all I want but unless I get out there and get walking, the knowledge, well it's useless. It's called discipleship. As a believer has anyone ever asked you “How's your walk?” I’ll get back to the walking in a minute. Here at FSI we are striving to make this walk the core of our ministry in Grand Rapids. We talk a lot about discipleship through missions here. We take groups to Haiti, Guatemala, Detroit and elsewhere to serve those there, while also focusing on the discipleship of those who follow us to those places. Our time with with those we work with we pray directs them towards a life long walk with their Messiah Jesus. It is an important responsibility and the core of what we feel our calling is here but just what exactly does that mean or look like? Often in today’s Christian culture we focus so much on beliefs. This is why we call christians believers. Yes beliefs are import and should be at the core. Discipleship, however is what comes next. It's the walk. The, “Lech Acharai” which is Hebrew for “walk after me”. Discipleship simply put is walking after Jesus. It’s what Jesus said to his first disciples Simon and Andrew in Mark 1:17, then later the others and yes to us. But it didn’t start there. It is why we were created. These same words are found in Genesis spoken to Adam and Eve who were created to be in the Garden tending to it but mostly they were created to “walk with God”. This walk however was lost, taken by sin. From then until Jesus came there were numerous attempts by man to work to get that walk back. It wasn’t until Jesus came to earth, and through his life, death and resurrection, re-established the opportunity to “lech acharai”, to walk behind him once again as intended from the beginning. This is what the journey of discipleship is. Once we become a believer, the walk begins and never ends. Jesus chose 12 simple guys to follow Him, to walk after Him. He modeled the walk while on earth with them. They saw the way he loved, served, taught, the way he treated others, the way he stood his ground, and the way he willing gave his life. They would also see how much He would believe in them, pour into them and empower them to carry on his cause even in the midst of their failures. The Bible is full of stories of those who pursued this walk. And the more we dive into scripture and apply it to our walk the more we can become like Him. This walk changes us and not our waistline. It changes how we view and treat others. It changes how we become in tune to his voice and spirit daily. This walk is essential for our spiritual health and it's not a single mission trip or a church service and doesn’t happen over night. It is not a walk of perfection yet a walk after the one who makes us perfect. It is a constant journey of true fulfillment. This was His intention with the first 12 and it is His intention for us! I John 2:6 says, “ Whoever claims to live in Him must live as Jesus did” Discipleship. So Jesus, knew that pouring deeply into this bunch of rag tags to modeling how to live, and by speaking life into them they would change the world. They then would seek to model Him to the world through their lives their writings and teachings. Today, the walk is the same us? Who are you walking after? Paul was an amazing example of this. Not one of the original 12 but yes one that would grasp the walk. Look what he says in I Corinthians 1:11 “Follow my example, as I follow the example of Christ”. You could say he simply is saying “walk after me as I walk after Christ”. Paul was striving in his life to make more disciples. Do you have a Paul in your life? Is there an opportunity to be a Paul to others? I am so grateful for those who were “Paul” to me. Those who believed in me, who mentored me, who led me to walk with God. Even when my walk was shaky, the believed in me. So that is what were are all about here at FSI. We are simply trying to walk after God, intentionally in a community of young people who I believe can change the world! We are striving to have them follow us as we follow Christ. No doubt I need to walk more and in more ways than one! Wrapping up fund drive for Solar Power Initiative for Damou Mission Haiti - A Huge thanks for the partnership with NorthPointe Christian Middle School to raise these funds!!!! Continued Fundraising for ministry operation costs. March 30 - Discipleship through Soccer- Siena Heights and Cornerstone University Women’s Soccer will be working with kids in a Soccer Camp at Mack Sports, doing fellowship together and competing in a spring game in Detroit. March 31- April 7 - Alissa will be leading a Physical Therapy Mission Trip with Pre- PT students from Cornerstone University to Hands of Grace Ministry in Guatemala. This will be an awesome time of encouragement for the Harrold’s of Hands of Grace, service through PT and discipleship as Alissa invest in the the team of students, many of who went to Haiti with Matt last summer. April 27 - FSI Service Day with MACC Sports in Detroit as they kick off their spring sports ministries through soccer and flag football. Greetings from Grand Rapids! A lot has transpired since we joined Friendship Sports a year ago. We can't thank you enough for supporting our ministry this past year financially and/or in prayer. We are grateful to Jim King, Director of FSI, not only for his invitation but also for his support this past year in what God is doing here. We are honored to be working with FSI and its 25 year history of discipleship through missions. Our family has adjusted well! Matt works in Teacher Education at Cornerstone, along with the FSI Ministry. Alissa has a job as a Physical Therapist in the schools here in Grand Rapids. Gabe and Elijah are doing great things in high school. Josiah has flourished in the elementary school—it has been amazing how his experience there has grown him academically and socially! While our entire family is here in Grand Rapids, Noah is involved in college life and attends a church with his friends and teammates. The rest of us have connected with a local church in downtown Grand Rapids and are involved in a microchurch group that supports families with adopted children. God has definitely been at work in our family this past year and has been in our midst through every step of the journey. The ministry through Friendship Sports has taken off faster than we ever expected. What started with one student building a trip to Detroit has now blossomed a great deal. This past October we completed our 7th trip to Mack Community Church and MACC Development with students, with an 8th planned for December. There has been a lot of discipleship opportunities and learning developed from these trips. We continue to offer a variety of mission trips and are excited to grow support for our ministry partners like Damou Mission, Hands of Grace and Mack Community Church in Detroit. Alongside these trips come great opportunities for discipleship with the students we are working with here. Currently we have begun working with three specific students seeking ministry internships with some of our missions partners, and two other additional students for mentorship. One particular student I have been working with has started a ministry on campus that has really taken off, and others are working on student athlete ministry opportunities. While working on campus we have made many connections and friendships with other coaches. Some coaches and other non sports groups have expressed interest in working with FSI for missions and discipleship in the near future. Haiti isn’t the only international trip happening. Alissa has a trip in the works to Guatemala in April with a small group of Physical Therapists from our church, and potentially some prePT/OT students from Cornerstone. While this trip is just in the beginning stages we look forward to offering more trips to support the Harrold’s and Hands of Grace Ministry in the future. Discipleship with the NorthPointe basketball program, and other opportunities to partner with NorthPointe in Christian discipleship. Partners in prayer who will pray for us-- that God will use us to do His will and make an impact on the Cornerstone campus, especially the student athletes as well as the other students we work with, and the missions organizations we partner with. We are looking for individuals or families willing to partner with us at $25, $50, $100, etc. per month through monthly giving or a one time a year gift. We are also hoping to partner with a handful of churches or individuals, both to be involved directly in this ministry which can mean joining us on trips, and to help in the financial support. You can donate by going to https://donorbox.org/friendship-sports-international or click on the donate button on the FSI website homepage found at the bottom of the letter. You can set up your online donation a variety of ways. It would help us greatly to budget if you can fill out your donation plans on the form at this link: Click Here. Should you desire to mail a check, make it out to Friendship Sports and send it to 2310 Rothbury Ct NE, Grand Rapids, MI 49505. All donations are now sent directly here to Grand Rapids as we have a local FSI account here to make things easier. Please mail in the final page of this newsletter with your check. To learn more about what has been going on at FSI, our missions partners and to follow the progress of our ministry, visit our website at https://www.friendshipsports.net/ or feel free to reach out to us directly at any time at FSIWallace@gmail.com. Please Note: FSI is a 501c3 organization and all donations will be processed as tax-deductible unless specified otherwise. Please do not put our names anywhere on the check per IRS rules. Instead, put our names on the return envelopes as ℅ Matt Wallace so that when the FSI office receives your gift check they will know to put the donation into our account. As I type this on the plane from Port Au Prince Haiti to Atlanta Georgia quite frankly I am overwhelmed. A little bit because our flight was delayed (it could be tight in catching our connecting flight to Grand Rapids), but mostly overwhelmed with joy from our recent trip to Haiti with the Cornerstone Women’s Soccer team. Coach Strawser runs the Thursday VBS soccer tourney. For starters, our team was amazing. This was a challenging trip to organize due to the nature of our team being scattered throughout the country during the summer, only to arrive on campus at Cornerstone less than 24 hours before our flight! We met and packed late into the night and then left for the airport at 3am. Once we landed in Haiti, the challenge really began... We were hit by a massive rainstorm as we loaded the vans and ended up in a traffic jam just outside of downtown Port Au Prince, causing our team to stay in vans for hours--stretching a three hour drive to nearly nine hours. Quite frankly it was miserable conditions. That night once we arrived, the spirit of the group was still amazing. I knew then we were in for a great week. 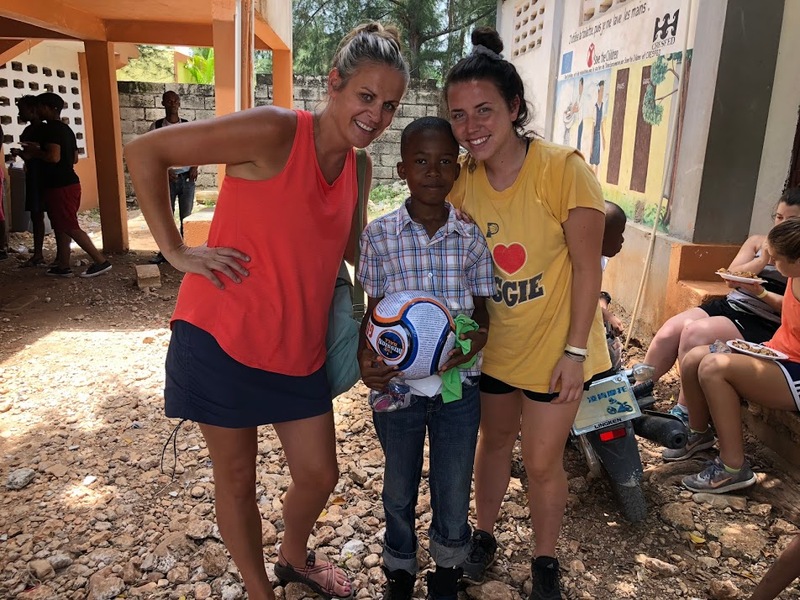 Meghan and Savannah present a Gospel ball to their new Haitian Friend. Their willingness to be patient, adapt with change, support one another, embrace the mission and the Haitian people was genuine and inspiring. The growth our team made throughout the week both individually and collectively was powerful. Each night we shared and had a devotion led by 2002 CU Women’s Soccer alum Megan Willink. She really challenged and touched the girls in many ways. Our team led VBS activities each day, played soccer with the locals both at the church and at the stadium (which was a first for our Haitian friends). They visited the various aspects of the mission, toured the village of Cyvadier, ate dinner at the beach and went diving in the beautiful natural springs of Bassin Bleu in the mountains above Jacmel. But no doubt, what touched me the most is how they embraced the youth and the workers of Damou Mission. Our team truly showed the hands and feet of Jesus in service, as well as in the love and compassion of Jesus through relationships! Especially towards our missionaries, the Eugene family. On the last night we took time for the Haitians to share with us words of encouragement. It was touching and such a blessing to hear them encourage us. Then we reciprocated back praise to them. Many of the Haitian workers were in tears not wanting our team to leave and touched by their words. I am excited for the continued opportunity of discipleship with this soccer team. I am also excited to see how this trip impacts their season on and off the field. God is at work in all of them and challenging them all in many ways! We have many talking about a return trip, child sponsorship, internships, and mission fundraising. Not to mention the discipleship and spiritual growth taking place among the team. Another major blessing to me was just seeing the health of the Damou Mission and the leadership of the Eugene’s. As someone who began traveling to Damou in 1998 when the founder, Tina Isenhower, was still building the mission house and other aspects of the school, it was great to see now twenty years later that many of the children she first poured into back then are now in leadership and are passionate for giving back and serving Christ in their community! Many students have gone on to be doctors, lawyers, and nurses throughout Haiti and we had the chance to meet a few of them. Others have remained in the community to work at the school and church! Many adults I recognized from when they were 11 and 12. And yes, every time we would talk with them, they would give thanks to Miss Tina! Especially Loubens, one of Tina’s first children to work with who is now one of the mission directors. Worship at Damou Mission House Balcony. Yes this mission has seen hard times...earthquakes, hurricanes, mudslides, government overthrows, and so many other challenges locally, but today Damou is flourishing again and the Gospel is going forward in the village of Cyvadier. A medical clinic will be set up this fall with the lead Doctor, Dr. Wilbert, a Damou graduate. A church is being planted in the mountain area, a vision Tina started years ago. Loubens is leading the youth of the church through intentional discipleship as well as helping Jessica as co-director in various other aspects of the mission. Jessica continues to help manage the school, run the young women’s program and carry on the legacy of her Aunt! And let's not make light of the fact that they just hosted a group of thirty in their home for a week flawlessly! I am excited to make you aware of two specific projects we will be working with in the very near future with Damou Mission. One is possible internships with students from Cornerstone. The second you can join in with us now! We are attempting to raise approximately $5500.00 specifically for solar power at the mission house. The total cost is around $9500.00 but they already have $4000.00 raised. Going solar would allow them to get off the grid and save them about $1000.00 dollars a month in diesel for their generators, and the $250-300 per month bill to the government for their 3-5 hours of electricity they receive. You can donate directly to this by going to the donate FSI-Wallace button on the homepage of our website or by going to https://donorbox.org/friendship-sports-international. Fill out your information and there is a drop down menu where you can designate to Damou Mission Solar Power Project. Checks can be sent to the address shared below. If you write a check, please ad a paper note in the envelope if you want the money to go towards the Damou solar power project. Last fall we began our FSI ministry here in Grand Rapids focused on providing discipleship, service and missions opportunities for the students of Cornerstone University and it has even expanded into neighboring high schools. To all of you who have helped us make this a reality I want to say “thank you”! I hope you can see your investment at work for the kingdom both in the lives of the students we lead in Grand Rapids, and on the mission trips we are and will be taking! More Detroit trips and return trips to Haiti and Guatemala are all being planned for this upcoming year. Please pray to continue/begin the support of Friendship Sports in Grand Rapids! Your support helps us with travel, materials, food, and more as we invest in the lives of those we are working with! We now have an account set up here in Grand Rapids. All donations can be made by mail to Friendship Sports International, 2310 Rothbury Court NE, Grand Rapids MI 49505, or online at www.Friendshipsports.net home page. Just click on the Donate-FSI-Wallace button. If you are interested in being a part of future trips to Detroit, Haiti or some of our other possibilities let us know via email at fsiwallace@gmail.com. As I type this blog, in just less than one month I will be on a plane that has just landed in Port Au Prince Haiti with the Women’s Soccer team from Cornerstone U. We will be traveling to Damou Mission just outside of Jacmel Haiti, a place that is near and dear to my heart. Our team will be serving in a variety of ways, from soccer camp to VBS bible lessons, to home visits, women’s programs and more. I am so excited to be able to introduce this team to the mission of Damou and the people there! I was able to have a great meeting with Jessica Eugene, one of the Damou Haiti Directors this week, to plan out the trip and hear about all the exciting happenings going on at Damou. I have been working closely with Cornerstone campus ministry, the soccer coach and specifically the team captains who dreamed up this trip, to plan and develop this trip to go and serve the people in Haiti to kick off their fall season!. There are future international trips not finalized yet, but in the works for the fall, January (possible teacher education students) and next spring/summer with other teams and student groups. I will share more details on these as they take form. Along with international trips, plans are underway to continue trips to MACC Development Mission in Detroit’s 48214 section. It is amazing to see the work being done there by such a selfless team of individuals that are striving for unity through the Gospel in their neighborhood! We are excited to partner with them this upcoming year in sports and housing ministry (and whatever other needs arise) in this coming school year as we develop a variety of college student teams to go and learn discipleship through service. To do such trips above, the key and focus is local discipleship within the college community! We are continuing to expand our discipleship opportunities on the Campus of Cornerstone, and we are expanding to Grand Valley State University students as well. We have also taking students from NorthPointe Christian High School and look to expand are impact there. We will be starting a Bible study/micro church at Cornerstone this fall and leading leaders to do the same at Grand Valley. Thank you so much for all of you who have prayed for us, came and joined us at times on Detroit trips, and provided funds to enable us to do this ministry. We couldn’t do this or think to expand it without the support. We currently have raised near $5000 and our goal is $10,000 per year to cover all costs. Support can be mailed or done online and you can find all that information right here on our website, www.FriendshipSports.net/Wallace. There will be collections at the Arcadia Christian Church in Indiana, and here at Cornerstone University in Grand Rapids if you would like to donate. Indiana Donations are being set up by Jessica Eugene, and you can contact Brian Grinstead at bkgrinstead@yahoo.com with questions. Please pray for us this month as we prepare for the trip. Pray for Haiti. The recent political unrest and rioting create such a challenge for so many. Pray for peace and stability in the days ahead and for those we will serve in Jacmel to see Jesus through us! What an awesome day of service I experienced this past Saturday. It was amazing on at least two clear fronts. First, I witnessed Philippians 2:14-16 lived out on that day. Second, I was able to see the kickoff of MACC Sports spring soccer program which provides over 125 kids the chance at an excellent soccer experience wrapped in the love and message of Jesus who without them would likely not have such an opportunity. I pulled up in the van near Miller Hall at 5:40 on Cornerstone’s campus wondering if anyone would come. I was reflecting on myself as a college student, wondering if I had this opportunity, would I have gotten up and came? By 6:00 am the van was packed with members of Cornerstone’s mens and womens soccer teams eager to eat donuts and journey two hours to Detroit to serve. This was the Saturday before final exams and there was a lot going on around campus that weekend. A lot of reasons not to go that would have been valid! Not one complaint, not one grouch in the bunch! We arrived at 8:10ish. For the next two hours they put up tents, put together soccer goals, set up cones, set up a soccer store and a concession stand, and they placed dozens of signs around the park... and yes they prayed over it all. All of this on a cool 35 degree overcast Detroit morning. The best part was the joy in which they served throughout! They even let me join in on a soccer game with them called “world cup”-- but we will not talk about how that went! Then came the kids and the community from all corners of Pingree Park. Our team jumped right in, loving kids, loving parents, working the soccer stations, the concession stand, the store and more, followed by the tear down and storage process. I heard at least two conversations during this time that were amazing. One conversation I heard while I was cranking out hot dogs at the concession. I listened to one of our soccer girls serve a local mom with amazing grace and maturity as they conversed about soccer, church, faith and their community for nearly an hour. I saw smiles on kids faces as they played soccer with members of the team, as they got new shin guards, cleats and soccer balls to take and use. Simply put, this group shined like stars without arguing and complaining, and they are from a generation that in many cases is getting a very bad rap. Instead of that, I was inspired. The joy they exuded in their service was contagious all around that day, and I am proud to say I was a part of this team. And I have no doubt they were able to energize the already amazing MACC Sports team that does this day in and day out. I am also so encouraged and challenged every time I go to the Mack Ave community! They are so intentional. They really understand missional living and being a part of a community! The unity they display in a world today that wants us to believe is unattainable is so encouraging. It's a unity deeped in the Gospel of Christ. The leaders and workers there refuse to led the world define who they are going to be as a community. These kids are coming out for the next several weeks not just to get good soccer skills, but also to be loved and to hear the message of Jesus and how it impacts the lives of the coaches, leaders and the kids themselves. Needless to say, even though it was an overcast day in Detroit, there were a lot of shining stars in the 48214, and I only hope our groups will continue to encourage them in what they are doing in their community. We have only been here truly connecting since December. I am so encouraged and energized with all the students that have partnered with us, and with the discipleship opportunities that lie ahead! I am asking you to pray specifically at this post for three student leaders I have gotten to know well in a short time. Pray for Brennan, a sophomore this year, a member of the men's soccer team and chapel worship band who is a education major and ministry minor. Brennan is working in a homeless ministry this summer in Los Angeles, California. Owen, who just finished is freshman year, also a men's soccer player who is really seeking God's direction for his life in ministry through sports and has become a leader in our ministry opportunities here. Lastly pray for Alyssa, a senior captain on the women’s soccer team this coming fall who has been working with me to set up the women’s soccer trip to Haiti this summer! Alyssa is also a very missions minded education major who will be student teaching next spring in Africa. It is truly a privilege to work with these three and so many others others like them as we journey together living out who God has called us to be! It is such a blessing to work at a University that cares for far more than just a degree track! Thank you for your continued prayers and support in our ministry through FSI at Cornerstone and the Grand Rapids community. God is at work in West Michigan! It has been a crazy spring... and not just the weather. God is beginning to open doors of opportunity through FSI here in Grand Rapids in a big way. We have taken two student groups to Detroit two different weekends, with a third coming up on April 28th. We will take a group of Cornerstone students, along with some men and women soccer players, to help MACC Development kick off the outreach soccer league through MACC Sports. It is an exciting opportunity to serve a community striving to share the love of Jesus to those in margins, and seek unity under the banner of Jesus. To me what is amazing about this weekend trip is that finals are the following week, yet these students are committed to working on the opportunity to serve! We are also working with NorthPointe Christian School Athletics to develop a short term trip this summer at MACC Development. A small group of Freshman basketball players, as well as the Athletic Director, went to Detroit on the March trip. Maybe the biggest news of the month that is extremely exciting is that we will partner with the Cornerstone Women’s Soccer team for a trip to Damou Christian Mission in Jacmel, Haiti in early August. The soccer team will arrive on campus and a day later will kick off their season by leaving Grand Rapids for Haiti. I have enjoyed getting to know and work with Coach Strawser, the Women's Soccer coach, as well as the entire Cornerstone University Athletic Department and Student Development. The desire to help students develop a strong Christ centered worldview and provide global opportunities is amazing! Cornerstone began working with FSI this year with open arms to both seek to provide global outreach opportunities for the students and discipleship. We are excited to introduce Haiti for the first time to the vast majority of the team. While in Haiti, the team will serve in a variety of ways. During our time in Haiti we’ll be immersed in the Haitian culture, gaining valuable exposure to and experience with the significant challenges and unique opportunities that Haiti has to offer. We will spend much of our time in the local village of Cyvadier serving the Damou Christian Mission. A good bit of our time will be spent at the school providing soccer camps, and leading the 100+ kids who participate in devotions and prayer. On Tuesday we will assist with a rapidly growing feeding program for mothers and their children. Through the week we will be helping the school prepare for the start of the school year which begins right after we leave. We will be visiting homes of some students, organizing supplies and participating in the local church of Cyvadier. Opportunities will arise to go to the market, hike to Bassin Bleu together, along with some very important team bonding. As many of you know, Haiti (while already in poverty) was devastated even more in 2010 by a massive earthquake. We will strive to carry the loving message of Jesus with us as we arrive to serve in whatever capacity we can and hopefully encourage all the workers of Damou while we are there. We desire to share with the team the story of what God has been doing there and help them discover personally and corporately how they can respond and serve as advocates for the specific needs of the people of Haiti when we return to the States. This week I challenged the team with a devotion found in 2 Kings 3:16-19. Sometimes it simply rains when we need it. Sometimes, such as in this passage and story, God promised water but only when trenches were dug. He would then fill the trenches with the needed water for the armies and their animals. Often we want God to not just fill the trenches for us but dig them as well. Sports teams such as soccer work countless hours at drills, strength and conditioning, skills and strategy all so that they are ready for the game. Those times of work our like digging the trenches. God doesn’t need us to do His digging, but He often wants us to show trust. There are countless examples of this all throughout the Bible. It was awesome to read and hear from the team as they began to commit. They are coming with open hearts and minds wanting to see God work in an through them however that fleshes out. As this team begins to prepare for the trip learning what it means to prepare and dig, we invite you to dig with us. How you ask? For hearts and minds of the CU Women’s Soccer team as they prepare. For the opportunity to open doors of discipleship in their lives. If you are interested in giving to FSI see our donation page for online giving options, or you can mail donations. Thank you to all those who have already partnered with us as we have began this journey in Grand Rapids! We live in very polarizing times. All you have to do is just read or watch a little bit of news or follow social media and you see it. The other day, I purposely kept flipping between a couple networks airing the same issue on tv but you almost wouldn’t know it. Their focus, stance, etc. were so vastly different from one another. We have focused a lot here on campus the past month on the topic of diversity and it has stirred all kinds of emotions. We are polarized on a lot of things, politics, social issues, race, and history just to name a few. There are so many opinions flying around and so many attempts at answers by so-called wise experts, and a lot of anger and blame thrown around as well. Many are focused on the symptoms, the outward issues and do not address the root of the problem, sin. This past weekend we took some college students to Mack Avenue Community Church and Development in Detroit. We were there to serve but also to learn, absorb and take back and that we did! This is a community that was almost totally destroyed by the division of racism, poverty and hate over the past several decades, and the devastation is clearly seen in neighborhoods and buildings all around. As we toured the 41824, those in the group were clearly shocked and moved at what we saw. What is amazing however is how things are changing because of the spirit of people in Mack Ave Community Church and Development. When you meet those like Charles and Ashley, just to name two, you don’t see division, you see the spirit of unity. Make no mistake, this community is diverse. There are those struggling in poverty and those who are not. There are different races and cultural backgrounds, but there is a real culture of unity rising out of the MACC culture. Its authentic! It is genuine! It is contagious and it's clearly rooted in Jesus. As you learn about the community deep down, you see that at their core, the Gospel shines out in the way they treat each other, in the way that they treat everyone in the 41824 through their ministry. When Jesus was on the earth, believe it or not, He chose quite a diverse group to invest in, live with and do ministry. At first glance you don’t see it because they are all Israeli people, however if you go deeper into who they are you see clearly. In His core group you will find a right winged zealot who comes from a group wanting to overthrow Rome, a tax collector seen by most as a leftist jewish sellout, and a handful of galilean fisherman, among others, who have some diversity in faith, education and even one who was all about the money. And that doesn’t count the men and women who were on the fringe of this core group working, supporting and learning right alongside them. Not only did He bring these guys together, but sent them off together as well to change the world around them and the whole world forever. He chose a group that could only find unity if He was at the center of their movement, if His voice was louder than theirs, if His ways were the ways they were all trusting in and conforming to, not the ways of man. Then and only then, could unity be found! He showed them the true enemy, sin, which separates us from God, and He literally lived out through His death and resurrection the answer of how to be what the book of Romans calls “an overcomer”. And even when He ascended to heaven He wasn’t gone, but He empowered them by the Holy Spirit He sent to dwell in them so they could march on, and that same spirit is available to us! In the ministry at Detroit, they are a month away from the opening of the “The Commons” on Mack Avenue: a coffee shop/laundromat. A outdoor community is also planned with seating, gardening and a stage. A safe place. A common ground. A place to find community. A place to build relationships. A place to see Jesus with skin through those who will be serving in ministry there. While some may see it as a foolish attempt in neighborhood God sees it as a place that has the potential to flip that community upside down. When the commons was being developed and the community was engaged on what are the needs a the top of the list was a laundry mat. We will continue monthly to journey to Detroit with students and allow God to show His strength through our weakness!. Our calling through FSI is two fold: to disciple those that we are leading into Detroit.To help them to learn we are all missionaries each and every day and allow these trips to stoke a passion in them to serve God. To help them find God's dream, not their own. To help them sift through the noise of the culture of today and clearly hear the word of God. We also want to make a positive impact for Christ in the places we travel to. We ask God to take us in our weakness and foolishness and show Himself through us! Next trip to Detroit is the weekend of March 17. Pray for us as we grow our discipleship group here in Grand Rapids. Pray for the Mack Ave community as they prepare to open The Commons and for their daily missional living in their community. Join us in a future trip to Detroit or beyond. Financially support our ministry through FSI as we use that money for ministry with our students. A tv show Alissa and I like to watch from time to time is The Voice. Alissa likes to follow the artists through the entire show, but for me I really only like the first round when the singer is attempting to get the judges (Blake Shelton, Adam Levine, and other famous singers) to push their buttons during a blind audition. If you have never seen it, an amatuer is on stage singing while four judges, with their backs turned, listen in. If they like them and think they can develop them towards greatness they will push a button, causing their chair to spin and light up letting the singer know they are wanted. For some, a chair never turns. For others, it's all four. Sometimes it’s just one. It's quite the cat and mouse game for the judges. They often then begin immediately arguing on who the singer should pick, who turned their chair first, which judge would be the best coach, etc! But, it is hard to watch when no chair turns. No sounds, no lights, just the resounding silence of “you’re not good enough” or “you are not chosen”. Working on a college campus can feel similar. I see college students so trying to win the approval of their professors, parents, their peers, even God. We often place people on these chairs in our minds hoping for someone to turn around and say “yes, you will make it, you will be a great teacher someday”. “Yes, you will be a great nurse, or social worker, or friend or athlete”, or “yes, I want to date you”. The truth is, insecurity haunts us all from time to time and we seek the approval of others to try and pull us out of it. Another truth is that the one whose vote counts the most has already turned His chair, long ago and we often don’t see it. I am no different. Being new here, at times I struggle to want my co-workers, family, and students to turn their chair and hit the buzzer when I think they should about me. Don’t we all? Jeremiah the prophet was a young man chosen by God and was equipped to deal with the biggest of challenges. If you think the politics and culture of our day is crazy, read the book of Jeremiah! During some of the darkest times of Israel's existence, Jeremiah was called by God to preach the message of repentance to the nation. Unfortunately, few to none listened and he spent most of his life alone, in isolation and persecution. It is what many might see as a real waste of time and talent. In the book of Jeremiah chapter 1 we read that God tells Jeremiah he was chosen even before he was ever conceived. Jeremiah felt inadequate but he is again reminded by the Lord that He would be with him through trials... What does this tell us? Jeremiah did nothing for God's approval. The Lord turned His chair and hit His buzzer long before Jeremiah’s audition of life. While Jeremiah faced great rejection by those around him, he would never feel rejected by God! This past weekend we had the chance to see a few modern day Jeremiah’s! People like Leon, Ezekiel, Eric and Sara (just to name a few) who are leaders at Mack Avenue Community Church and Mission in Detroit, Michigan. This ministry is not easy! They don’t have luxuries most American churches have. They live in a culture struggling for unity, struggling for hope and identity, yet they march on each day to the approval God and His calling on their lives. We saw the fruits of what God is doing there in just a short time. God is working in their community with the Gospel through sports, jobs, tutoring, legal help and a relational, authentic church. Fruits that come from those who seek the approval of God, not man! I believe God wants this for all of us! We believe God has brought our family here to Grand Rapids to help disciple more Jeremiah’s through missions. This generation of millennials have so much to offer! I see so many potential Jeremiah's. So many Eric and Sara’s. When I look at my boys at home, I see the same. Through our ministry I hope and pray God will use us to speak life into those in our path. We pray we too will have the faith of Jeremiah to trust God to use us here His way. As we continue to develop ministry here and put together future mission trips to Detroit and beyond we pray for the Jeremiah’s we will be working with. We pray He will use us as a vessel so they see God's approval on their lives and we help empower them towards an eternal purpose. We are extremely thankful for those who have partnered with us so far financially. We have a ways to go to reach our goal but we are off to a good start. Upcoming meetings with Mack Avenue Community Church leadership for needs and possible upcoming spring trips to Detroit are in the works. Meetings with Baseball and Womens Soccer in the new year for potential overseas trips in the 2018-19 school year. Prayer for possible mission trips with NorthPointe Christian School. Matt is meeting with a group of students soon to begin a Bible study. JIm and Jenny King will be coming in April, we pray for opportunities to develop deeper partnerships while they visit. Matt will be going with Jim to Honduras to help lead a trip and learn about leading future sports trips there. Again our goal is to disciple college students and help them find their role in the church. This generation of believers are tomorrow's church leaders and they are faced with a crazy world to steer through. Students at a Christian college often come from a wide variety of backgrounds and are very open to spiritual growth. We desire to build relationships with students, and mentor and lead as we strive to challenge them to develop a Scripture based Christian worldview and a heart for missions. Often the call of God can be uncomfortable, challenging and hectic at times. Our family has been through a lot of changes in the past 8 weeks as we seek to follow God and where He is leading us. Adjusting to new jobs, a new home, the boys a new school, and all that comes with moving to a new state can at times have your head spinning a bit. We have had lot of work to do on our house. Visiting a new church, and developing relationships in a place where no one really knows us is also a challenge we are not used to. It reminds me of Luke chapter 2 and the journey of Mary and Joseph-- and while our journey to Michigan is no comparison to theirs, the story has had some new meaning to us this season. I am sure during Mary and Joseph's calling, some didn’t understand, even scratched their head. There definitely were moments of questioning, moments of inadequacy, and just simply moments where they were not sure where to go or what to do next. Those things I get. What I don’t relate to is a virgin birth, a visit from angels, dealing with a first century census challenge, the journey on a donkey and settling in for the birth of the Messiah in a barn/cave because no one had room for them to bring the Him into the world. Not to mention a visit from several complete strangers and a host of angels all underneath a blazing star once he was born (WOW!). The responsibility of caring for and raising the Messiah of the world had to be overwhelming, but with all of that we see Mary had peace. Wow! How in the chaos, pressure and change was she able to find time to ponder, to treasure. But isn't that an important part of walking with God? Reflecting and treasuring our chance to be in a relationship with Him is vital! John 1:14 reminds us that “The Word became flesh and made his dwelling among us. We have seen his glory, the glory of the one and only Son, who came from the Father, full of grace and truth.” He is with us in all of our chaos, whether self inflicted or simply on the path of our journey. And no matter how busy, or how challenging things get, we all must find time to stop and ponder/treasure the blessings He gives. During this time of year many feel lonely, stressed and may even feel like they can’t find Jesus. But remember what He shared with His parents, “why are you searching, don’t you know I must be in my Father's house?” In the Scriptures He reminds us often He is with His Father on our behalf, providing grace and truth for us through His spirit. As I ponder this season, our family has so many things to treasure and be thankful for, from friends and family back in Indiana to all the new blessings happening here in Michigan! We look forward to a new year, and a chance to journey with the “God of peace” and see what He has in store. The opportunity for ministry before us is tremendous! It's my prayer that we will take time to treasure each other, all He is and all He is doing. We have made good connections here in Grand Rapids for future ministry opportunities with students! Connecting with Mack Avenue Mission in Detroit to discuss trips with Cornerstone students in the spring. Matt is meeting with a group of students in January to begin a Bible Study.